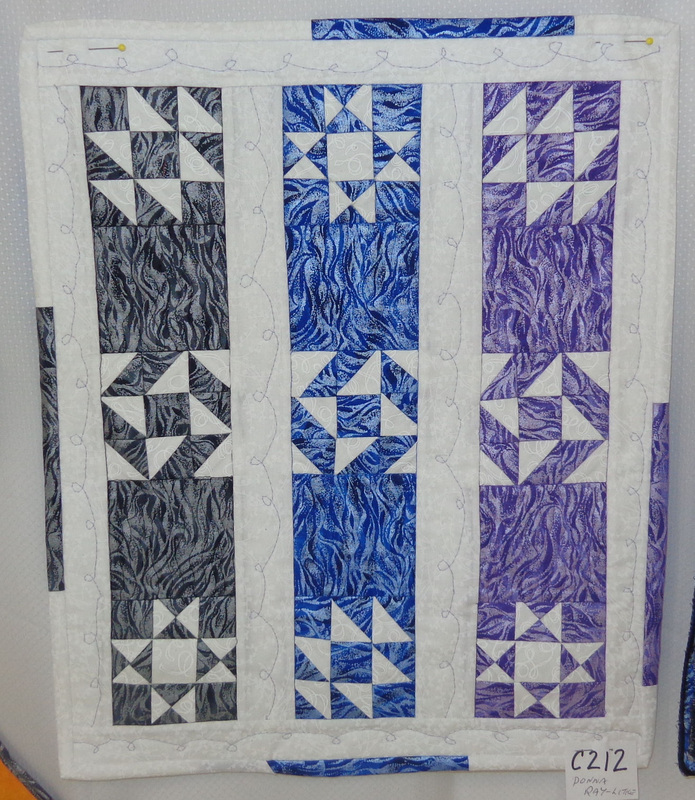 After feeling very burnt out working on the centennial quilt I didn't do much for a while ... but I'M BAAAACK!!!! 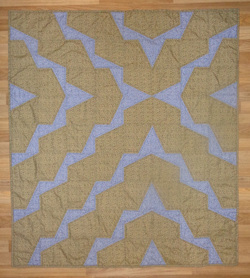 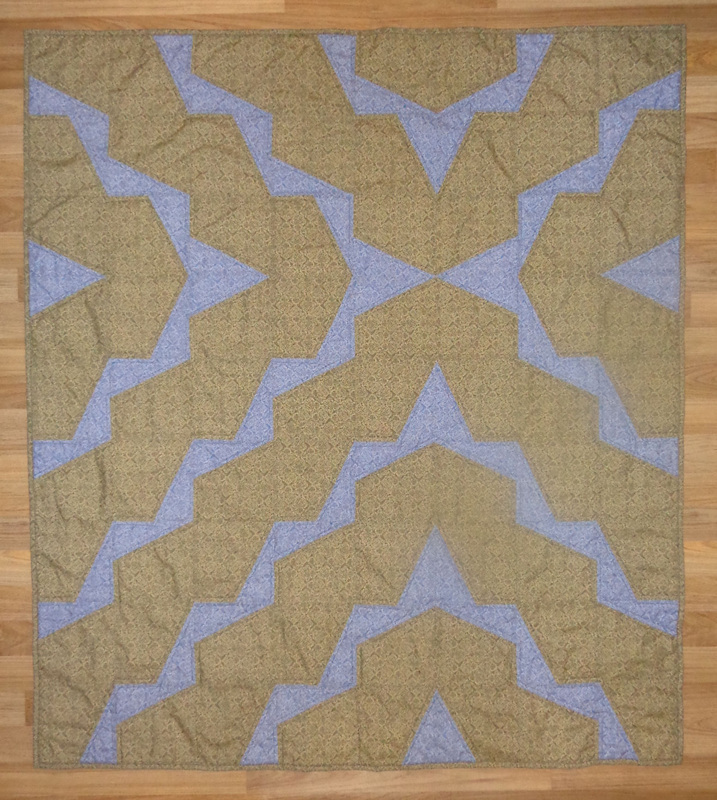 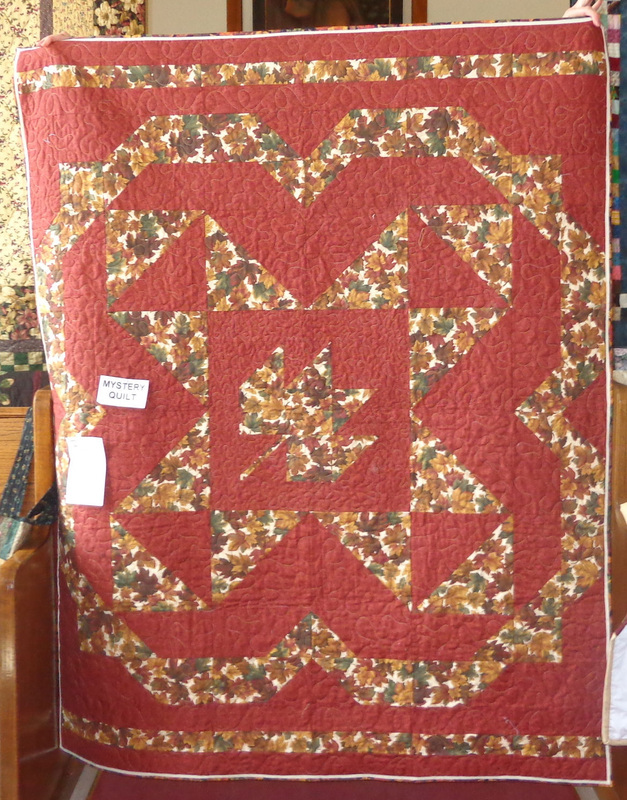 1) Maple Leaf Quilt. 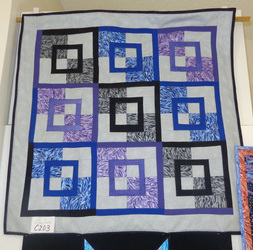 This is a Mystery Quilt that I designed. 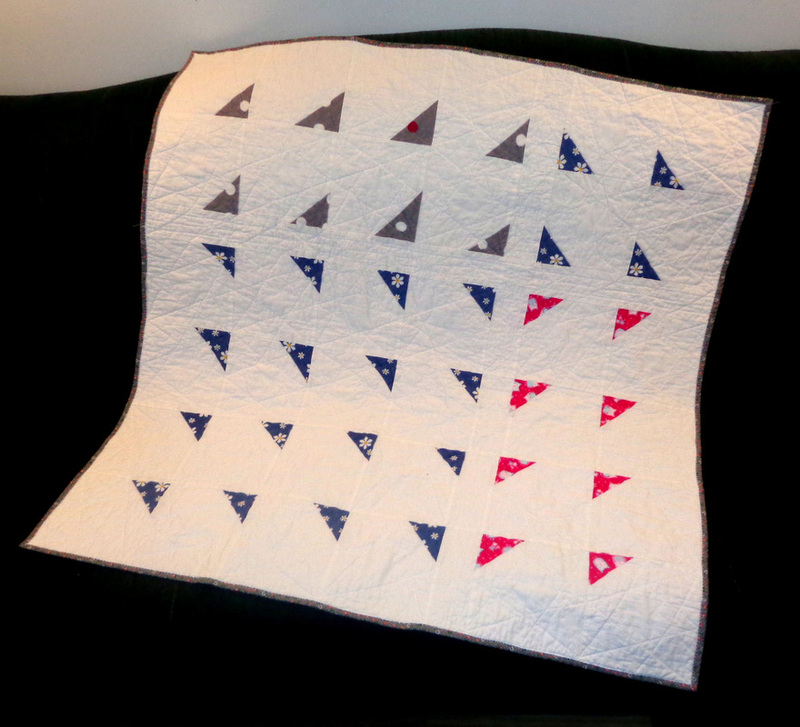 I will eventually donate it to the Quilts of Valour. Measures 52" x 65"
3) From the Bernina website, www.weallsew.com I did the Sunrise Baby Quilt Sew Along. 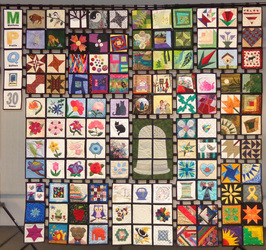 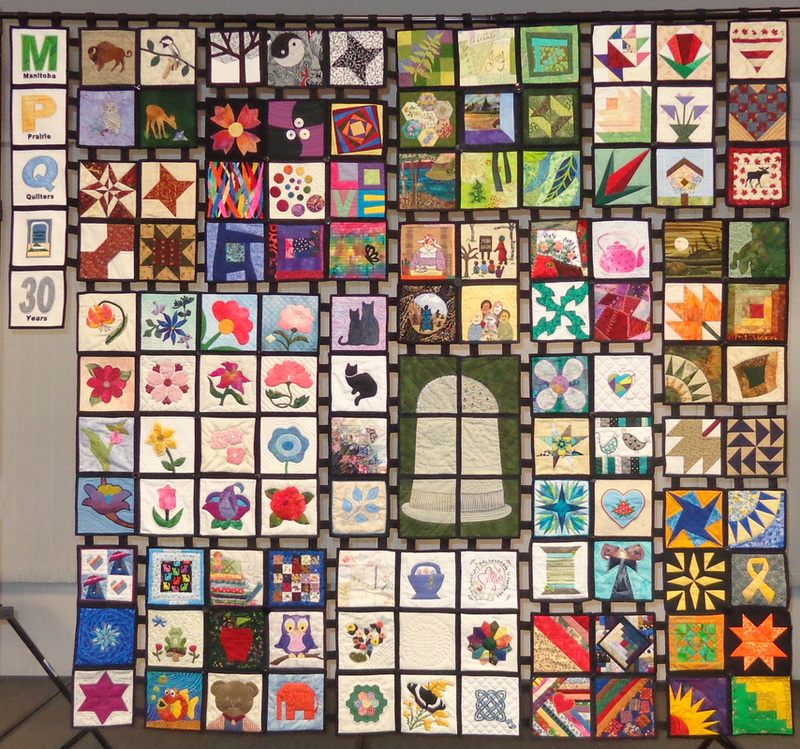 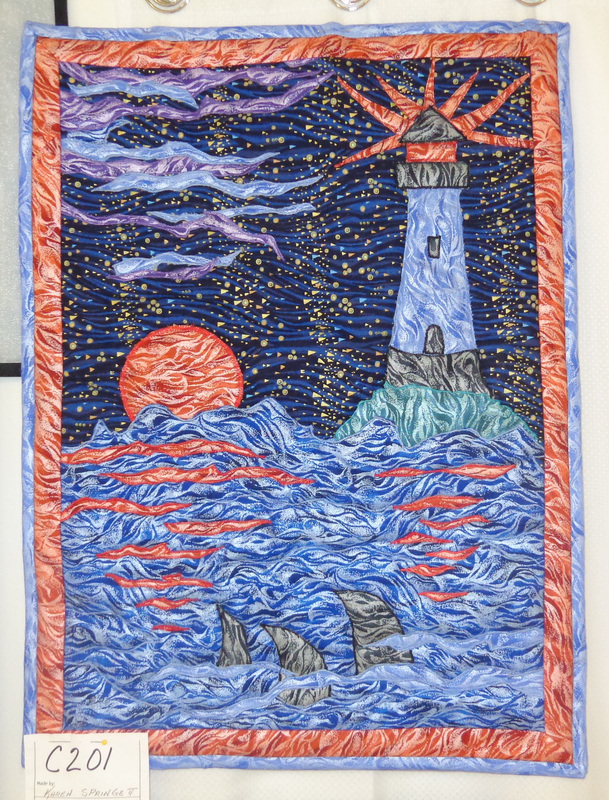 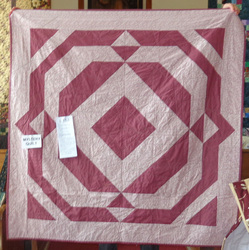 42" x 53"
I designed this mystery quilt and presented it to Common Threads. 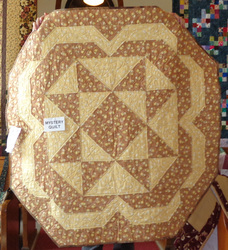 It is designed so that they wouldn't all turn out the same. 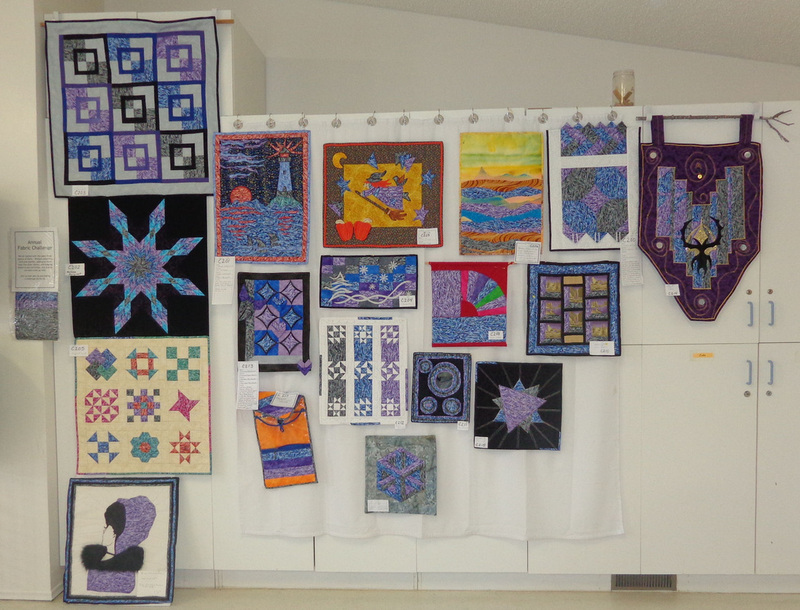 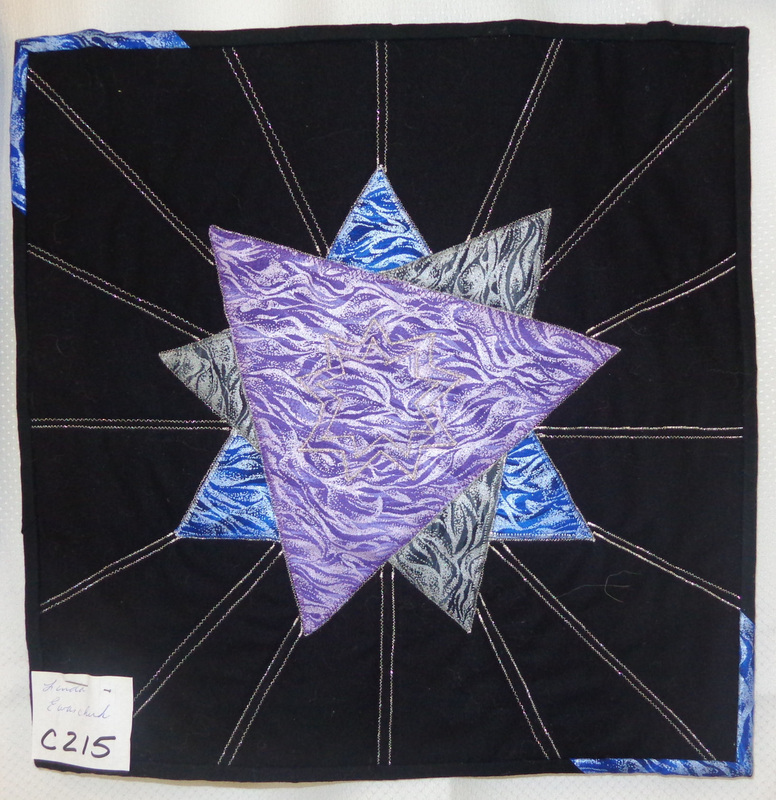 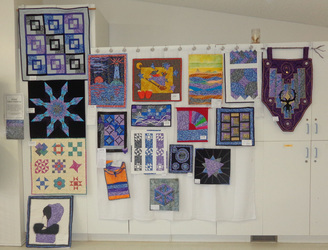 A total of 8 quilts were made. 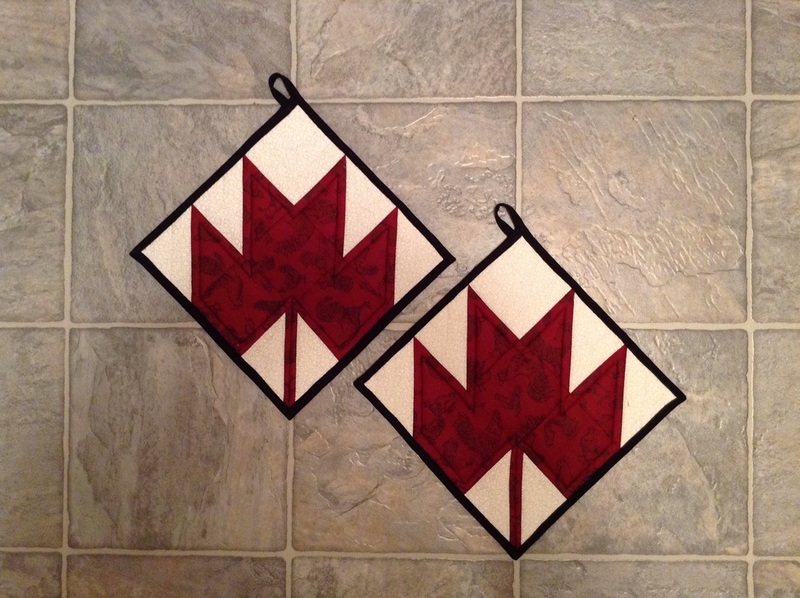 I'm very impressed with how they turned out. 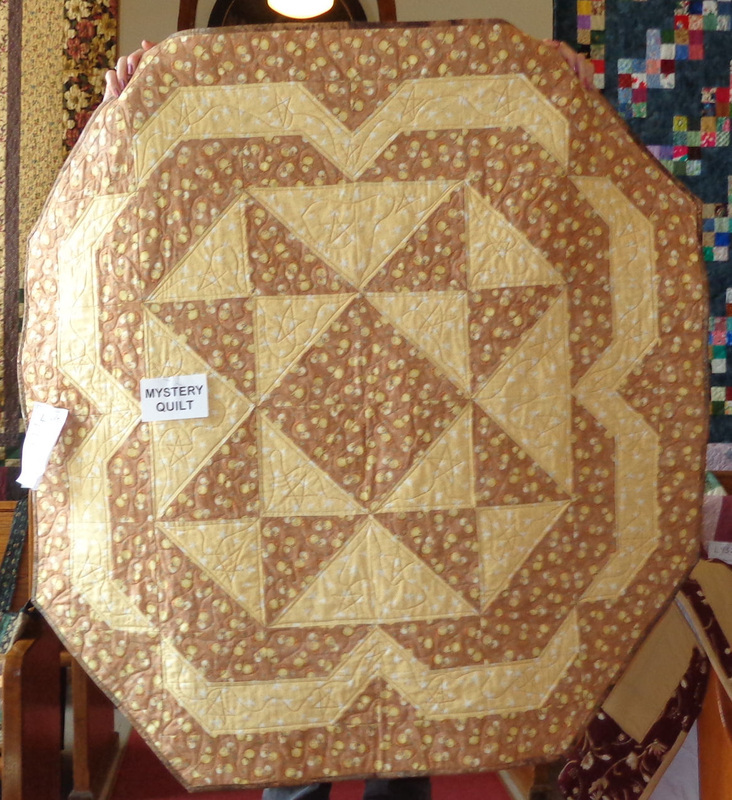 You might not even guess they were all the same pattern. 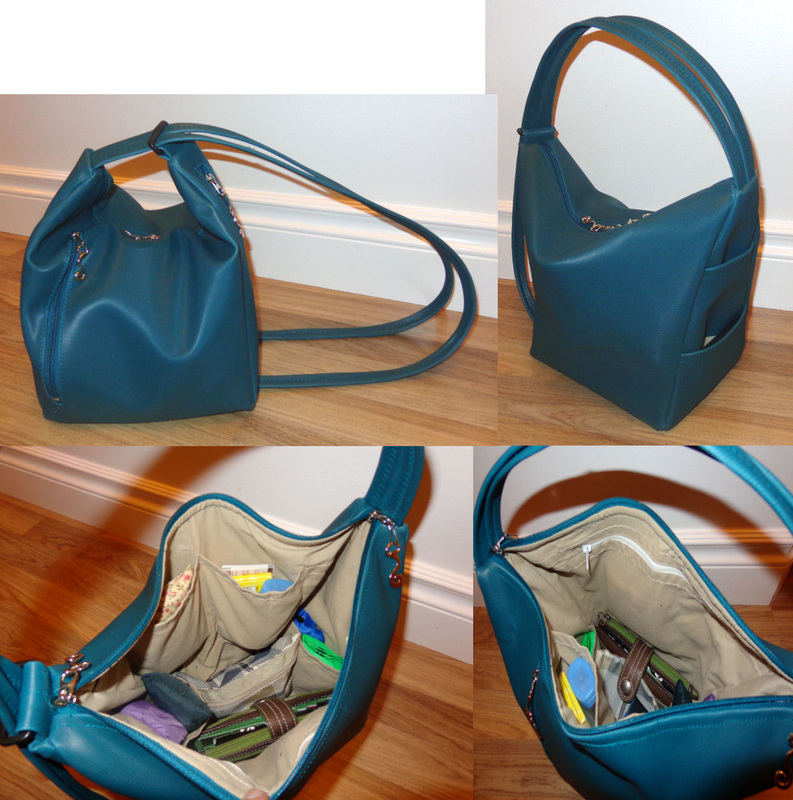 My first project of the year was to finish the purse I started before Christmas. 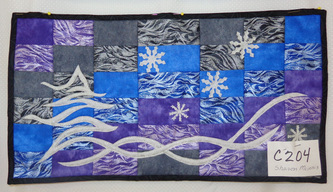 I loved the style of the purse I was using but it was showing some serious wear so I copied the design. 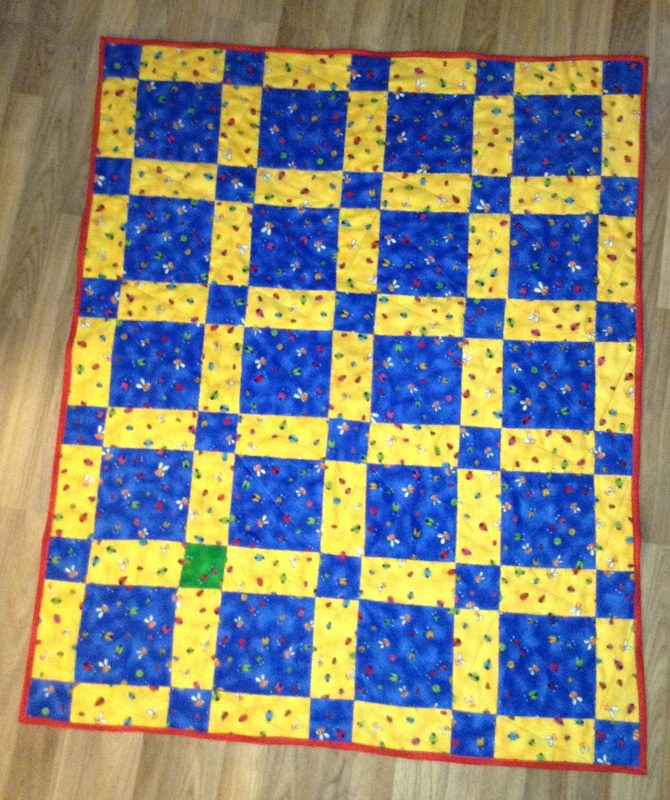 I added a few extra pockets on the inside. 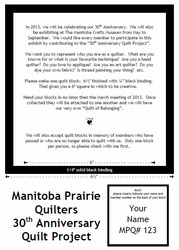 Challenge #3 - Find a greeting card, a logo, a picture from a catalogue, a box, etc. 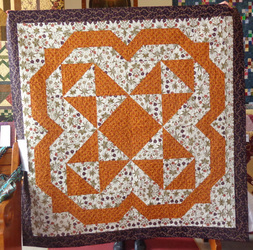 that has a design on it that you like and copy it in your little quilt. 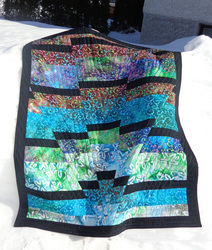 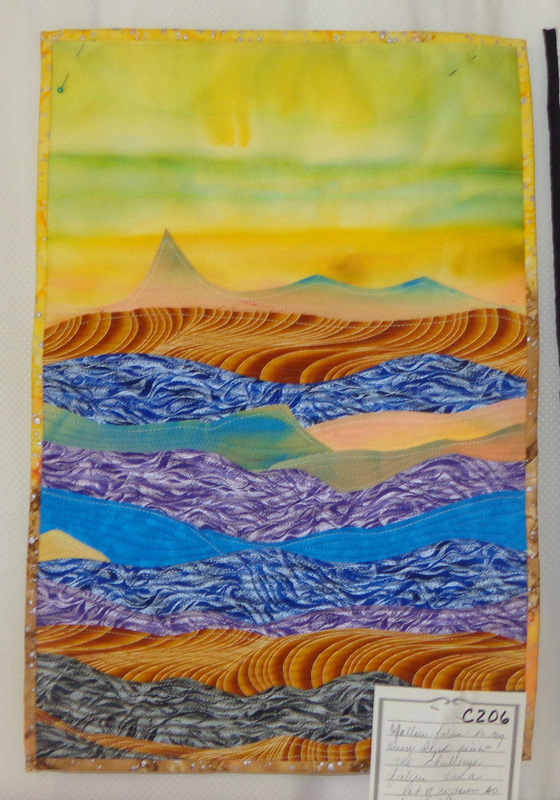 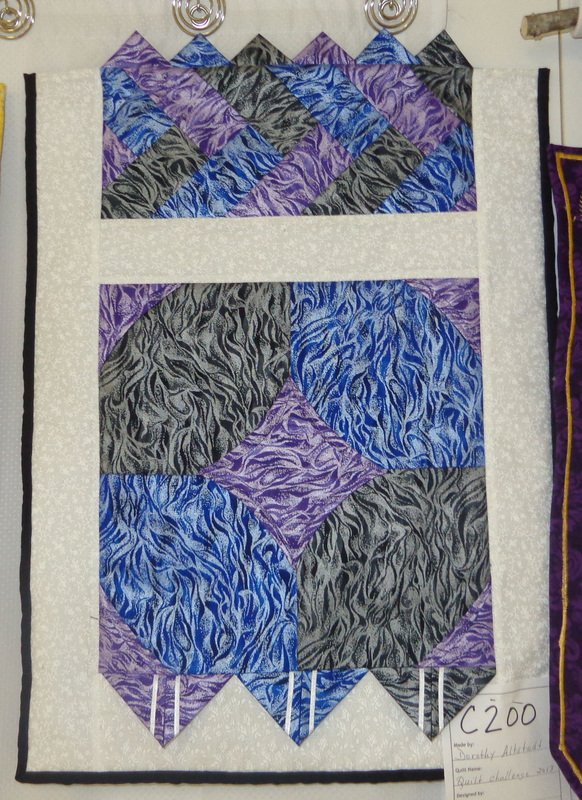 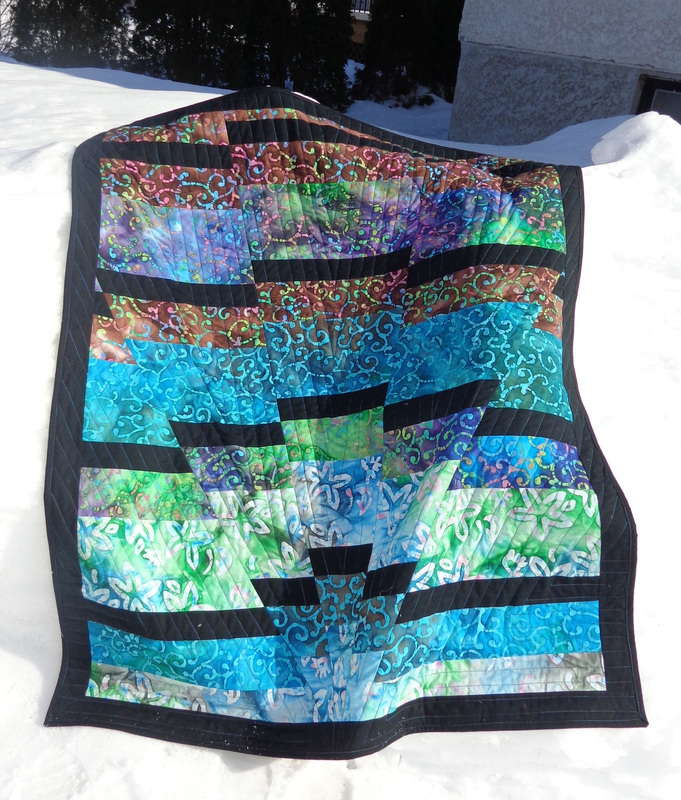 Challenge #4 - Incorporate weaving into your quilt. 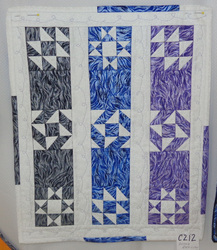 Challenge #5 - Use the Stitch & Slash technique by Carol Ann Waugh. 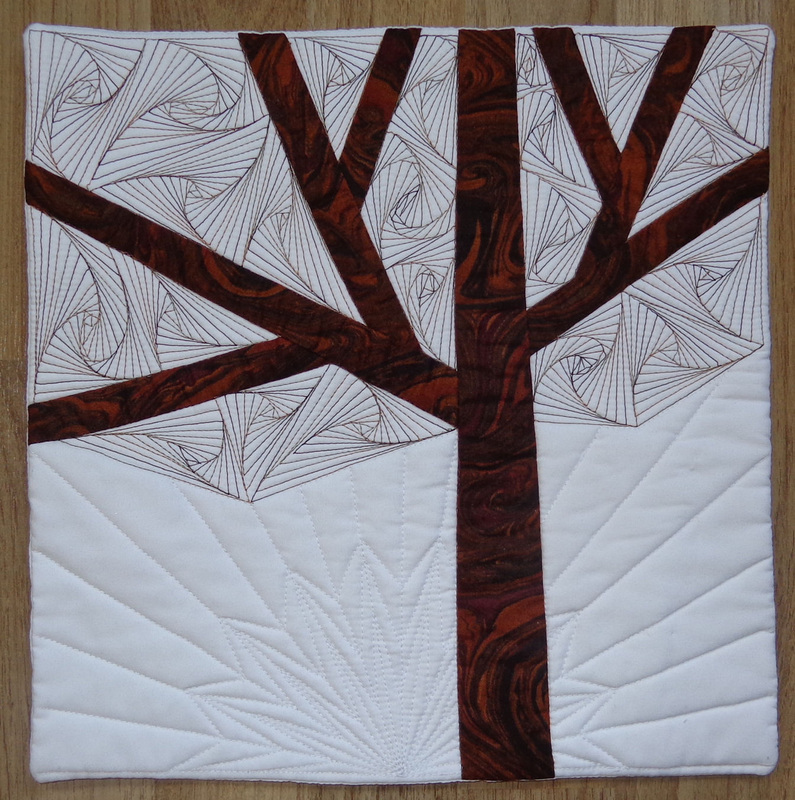 Check it out on Craftsy. 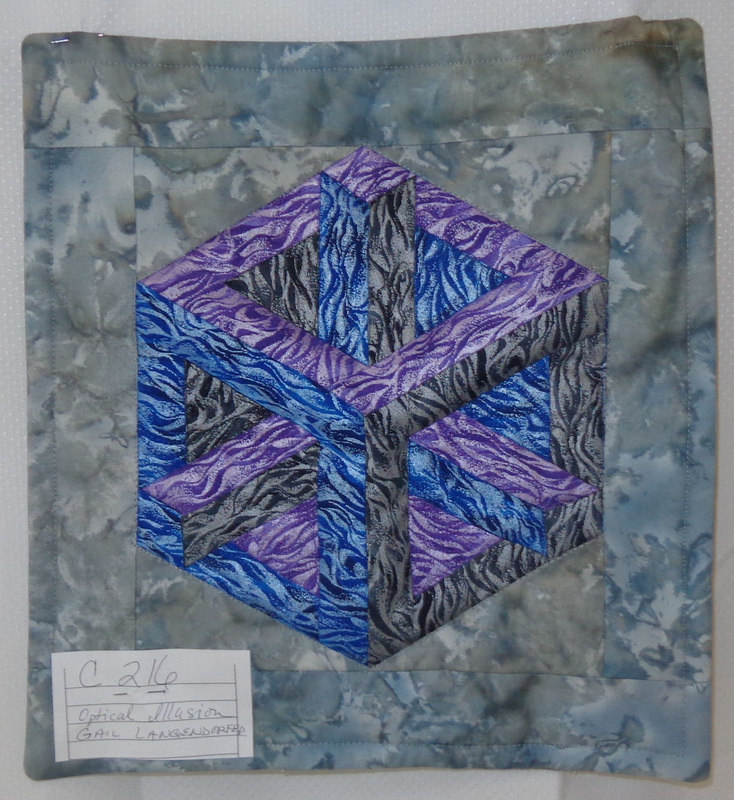 This year's challenge started off with three fabrics of the same print. 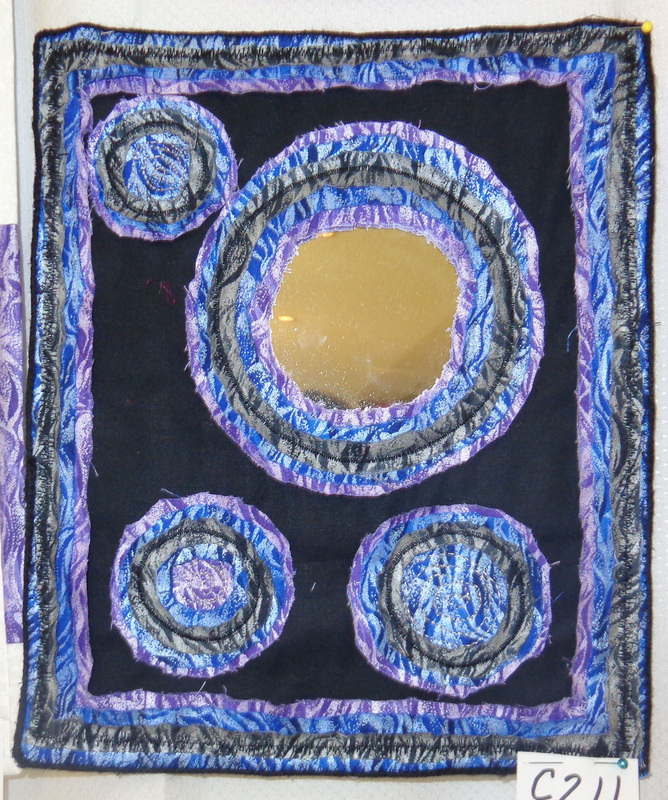 The colours were blue, purple, and black. 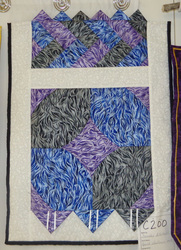 We could add up to 5 more other fabrics and the piece had to have a perimeter of 120" or smaller. 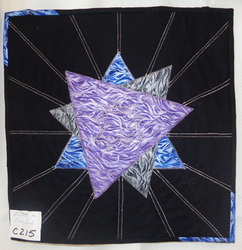 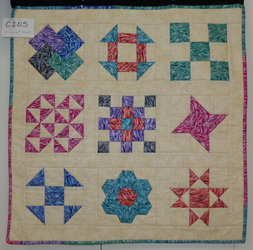 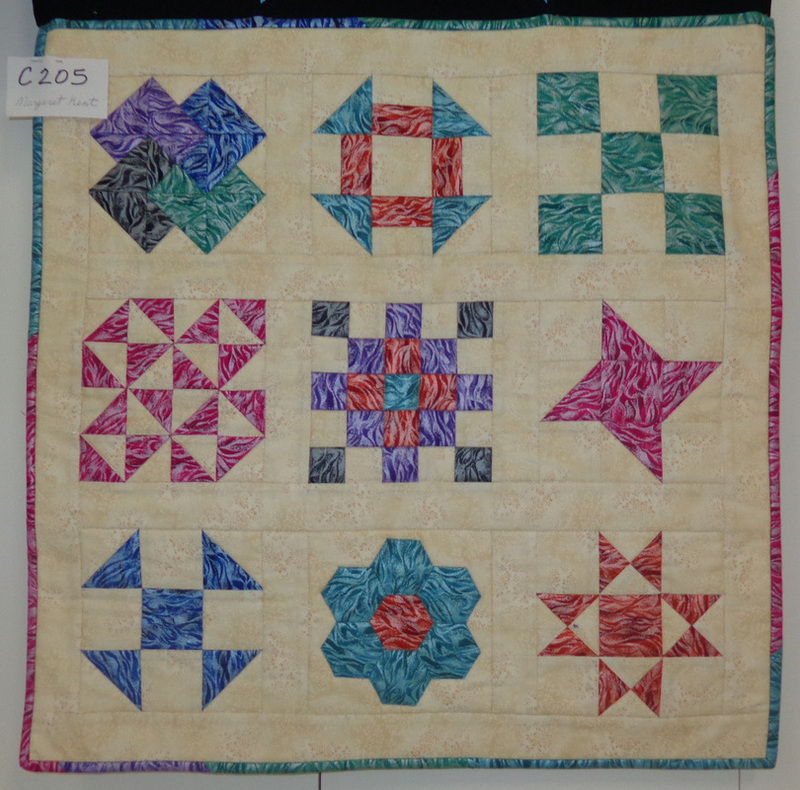 Miniature Quilt, any theme, any technique, hand or machine quilted,size not to exceed a maximum perimeter of 120”with maximum block size of 5”. 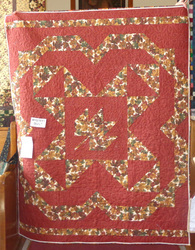 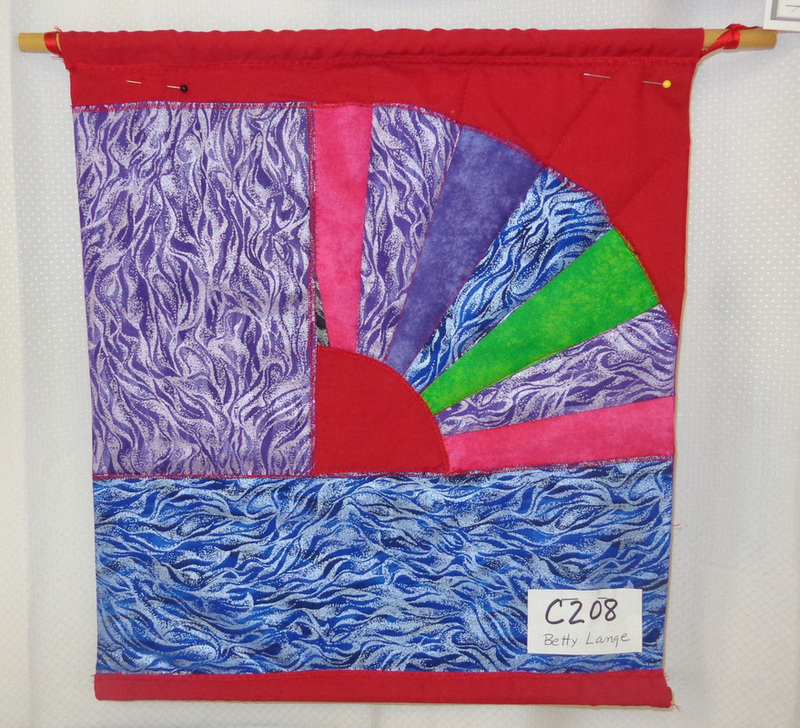 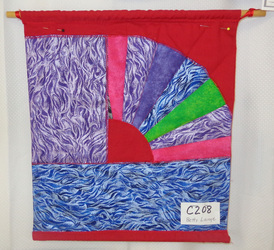 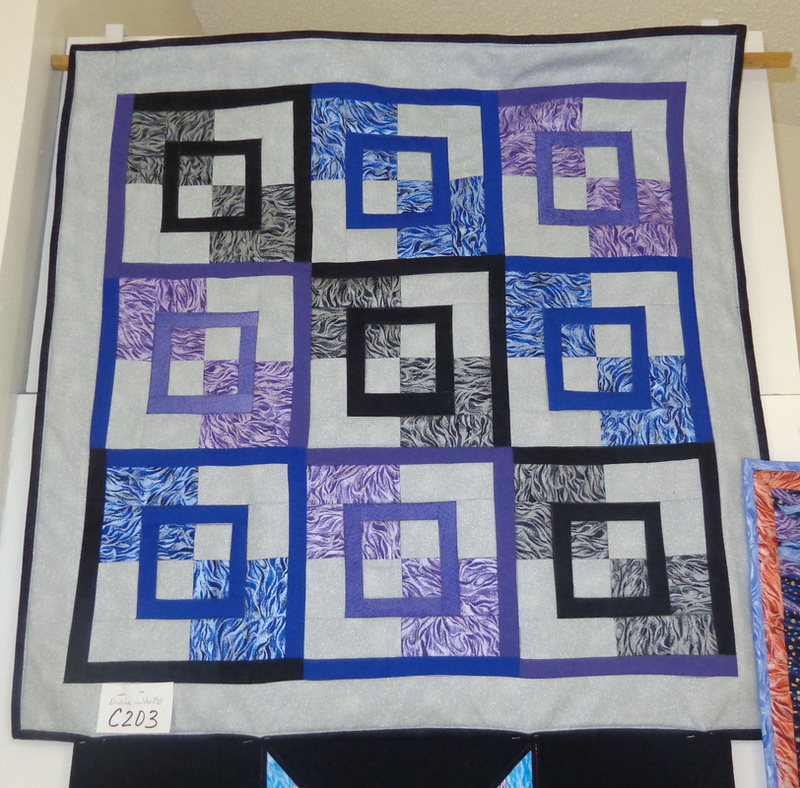 Most important qualification is that your quilt should represent a full-size quilt that is miniaturized. 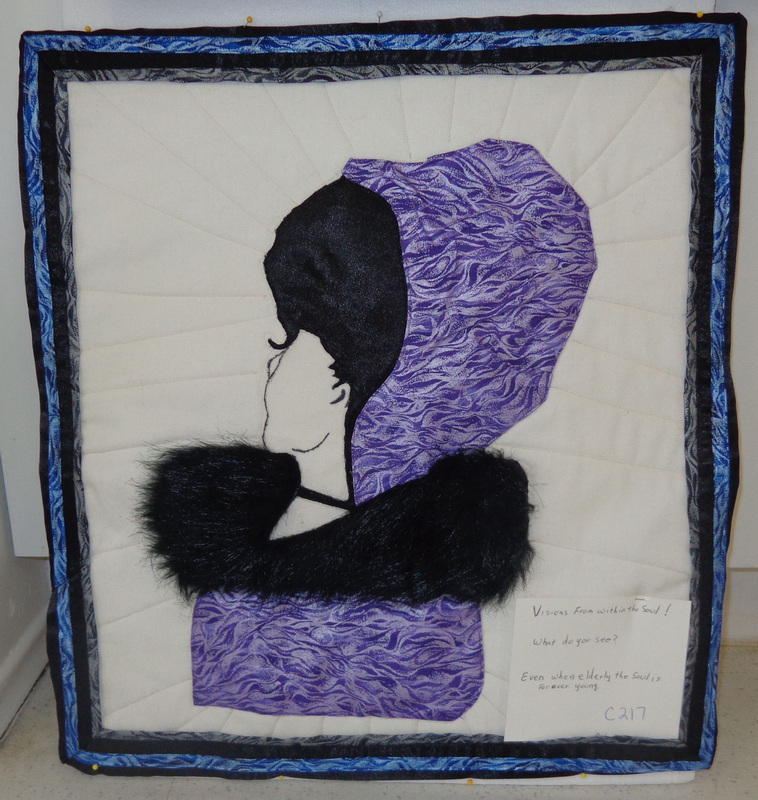 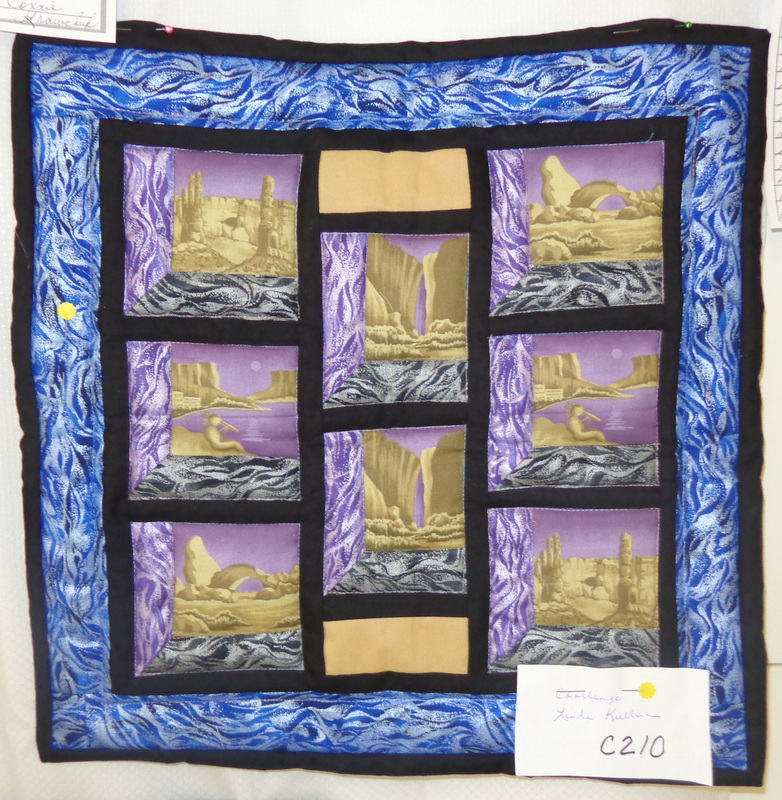 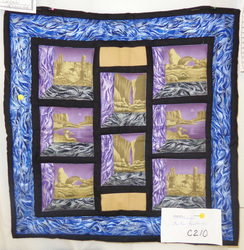 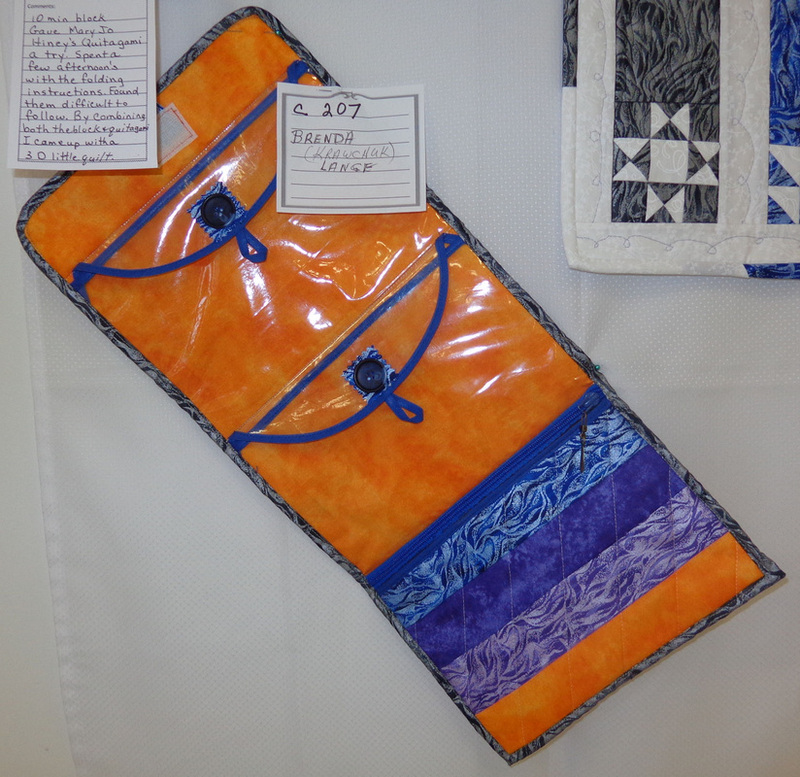 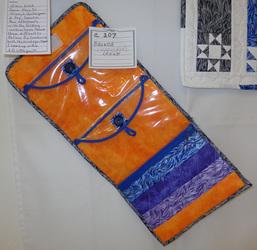 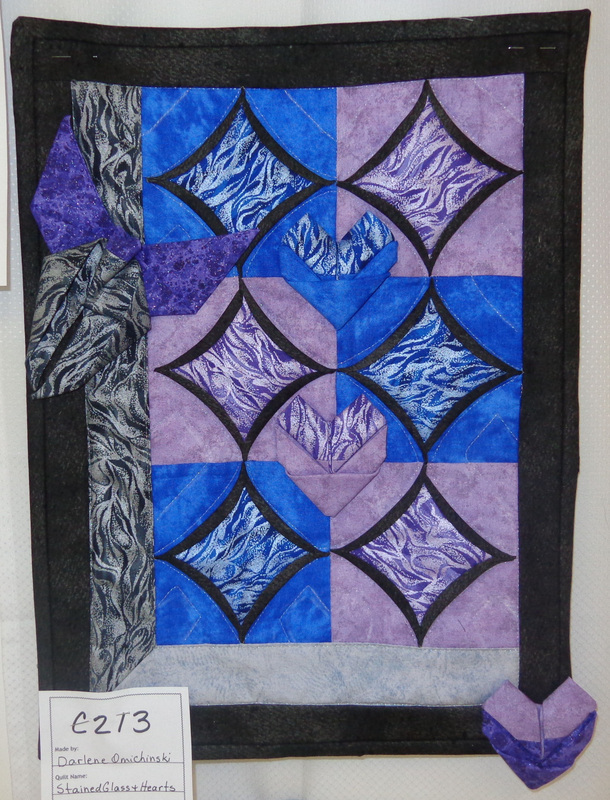 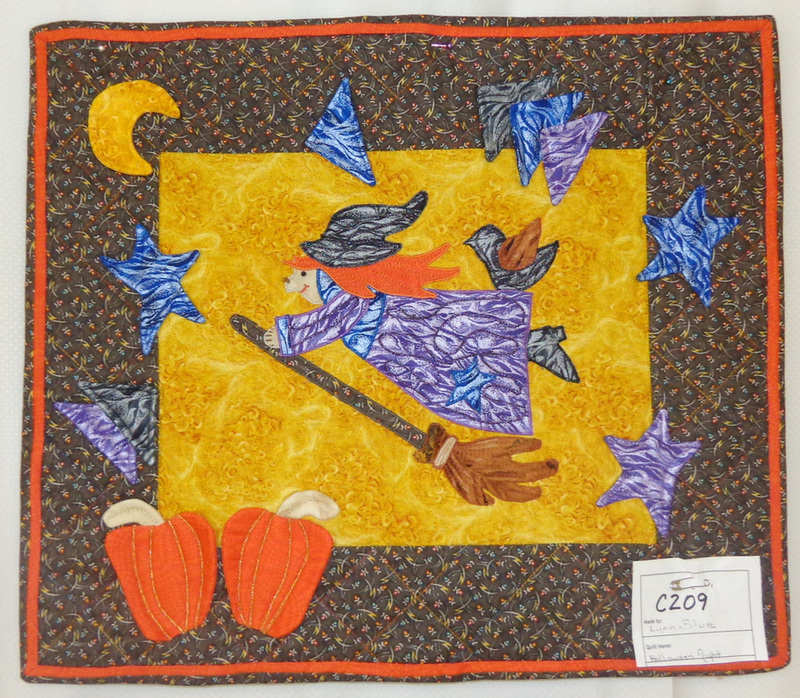 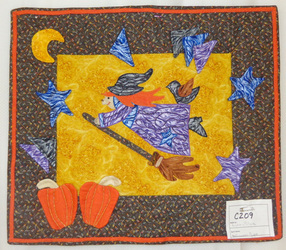 * I also received the prize for Excellence in Free Motion Quilting. 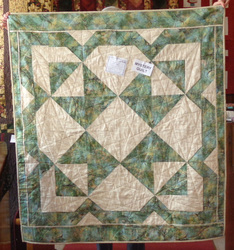 Hand or machine pieced - domestic or hand-guided machine quilted - small. 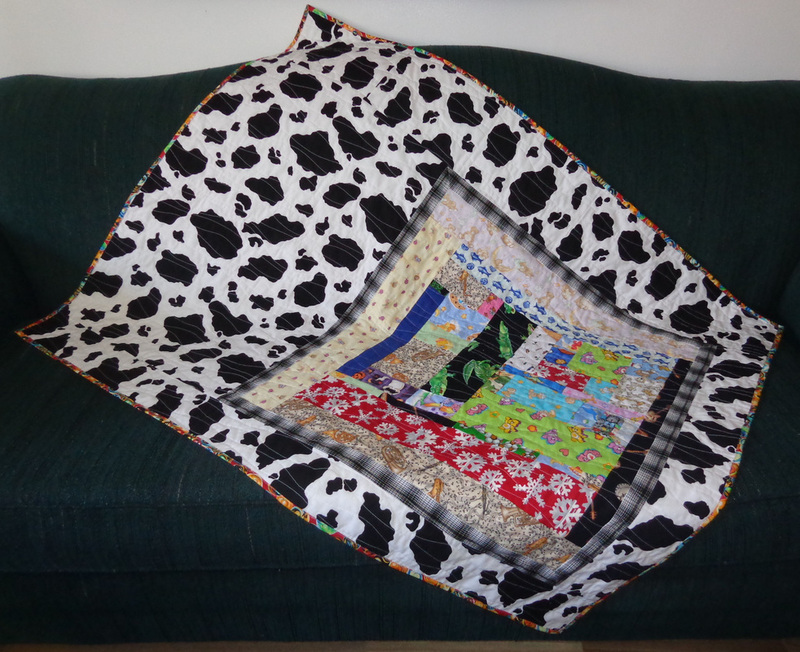 2013 Don't have a cow. 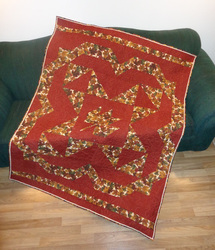 I randomly sewed scraps together from previous Eye Spy Quilts that I've made. 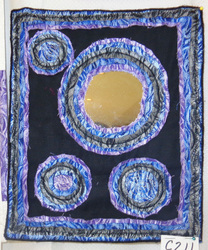 I was working on it at the Common Threads Mini Retreat. 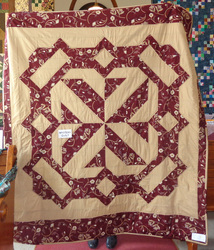 One of the other girls was cleaning out her stash and was giving up the cow fabric so I finished off my quilt with it. 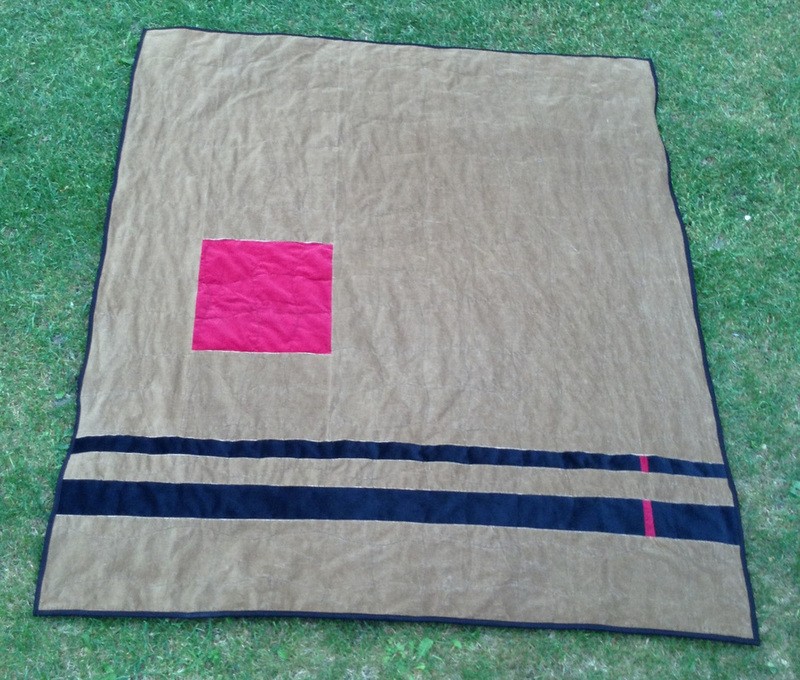 It is backed with a jersey fleece which gives it a softness and a nice drape. 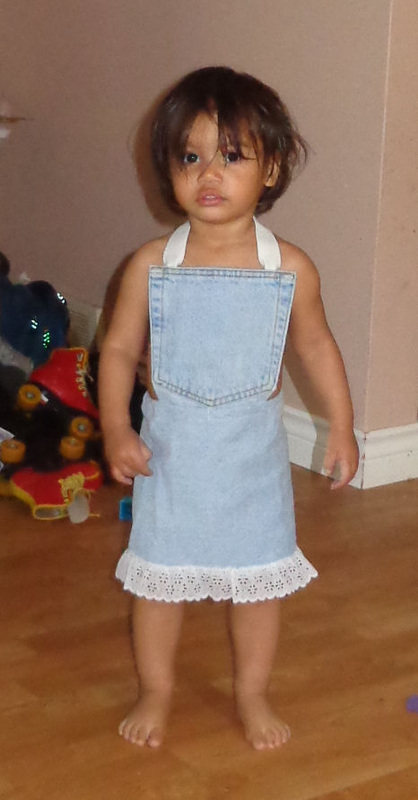 Mommy and Sareim each have an apron and Aya wanted one too. 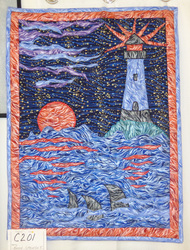 Made from an old pair of jeans. 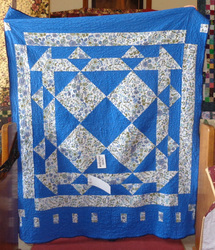 A baby quilt just because. 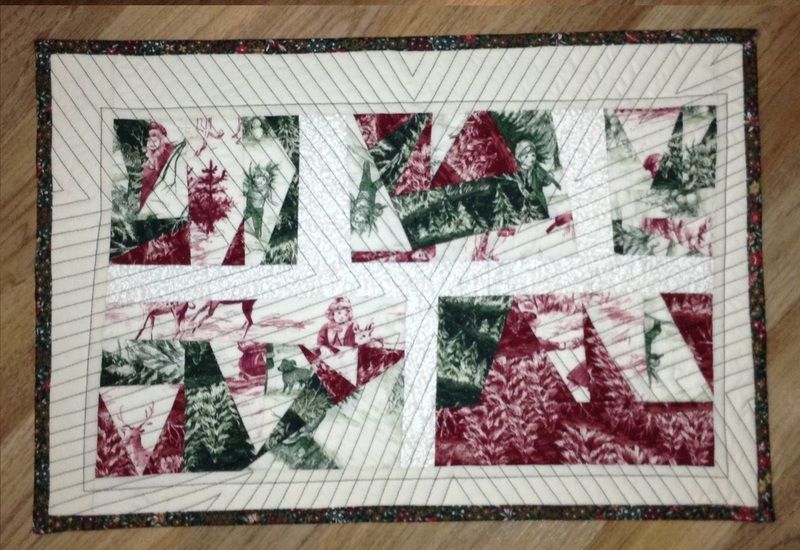 I found flannel fabric that I had already cut into 6 1/2 in squares. 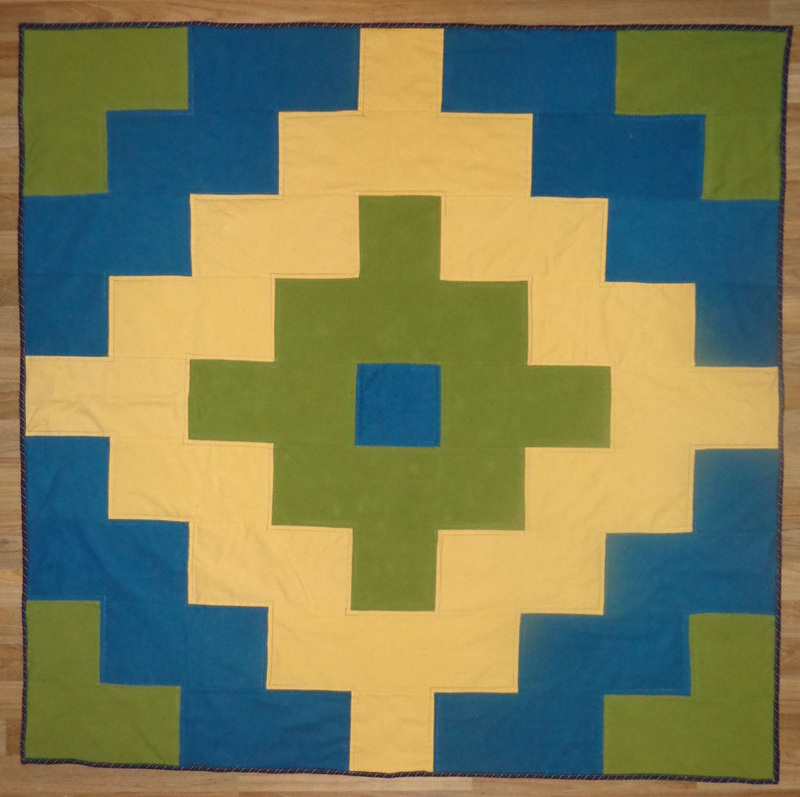 It was left over from another project. 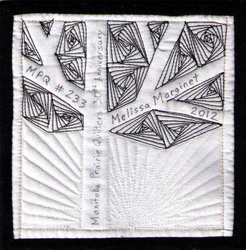 This is the disappearing nine patch with an extra row added to the side and bottom. 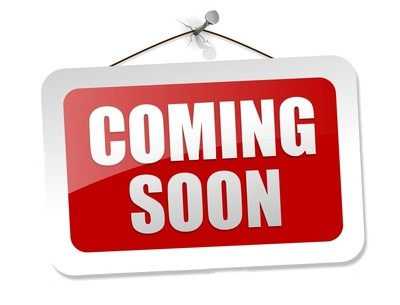 I also added a little surprise to keep you wondering. 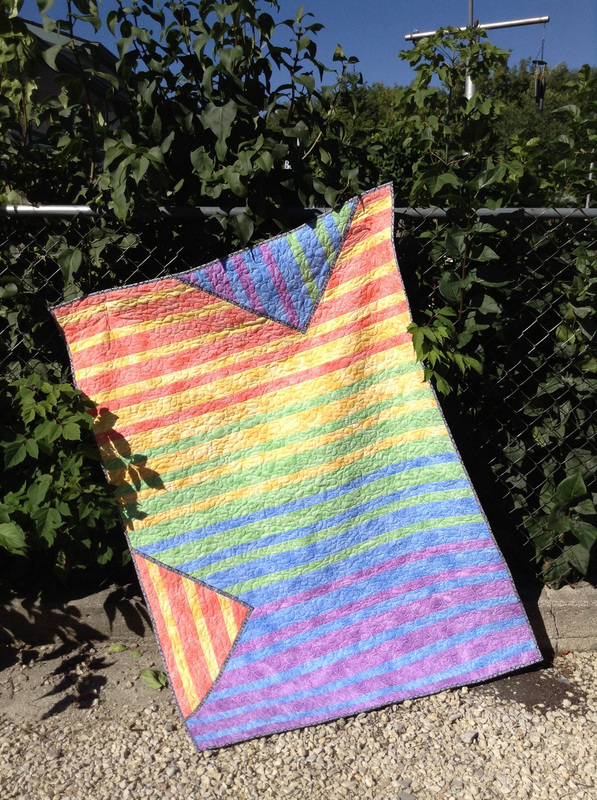 I put a fleece blanket on the back so it is a very soft quilt. 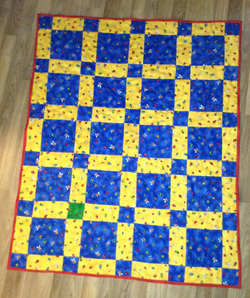 Given as a gift to Nate and Lindsay for their baby boy. 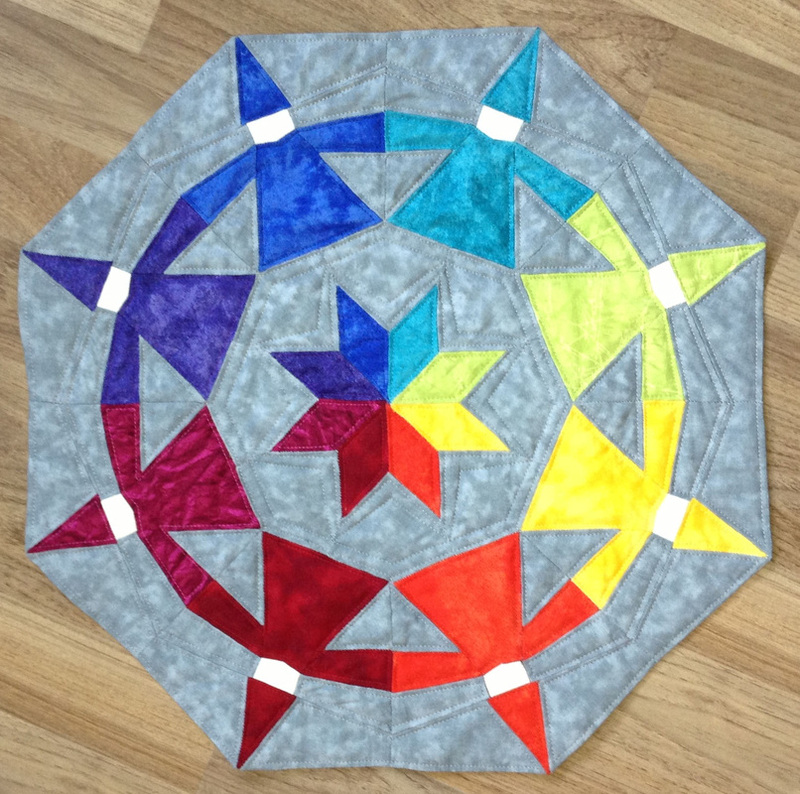 I wanted to English paper piece a ball so I made the Eye Spy Ball using 12 pentagons. 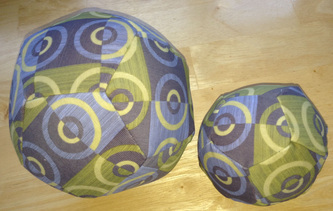 My daughter asked if I could make some lightweight balls for the kids that can be thrown in the house and not cause damage. 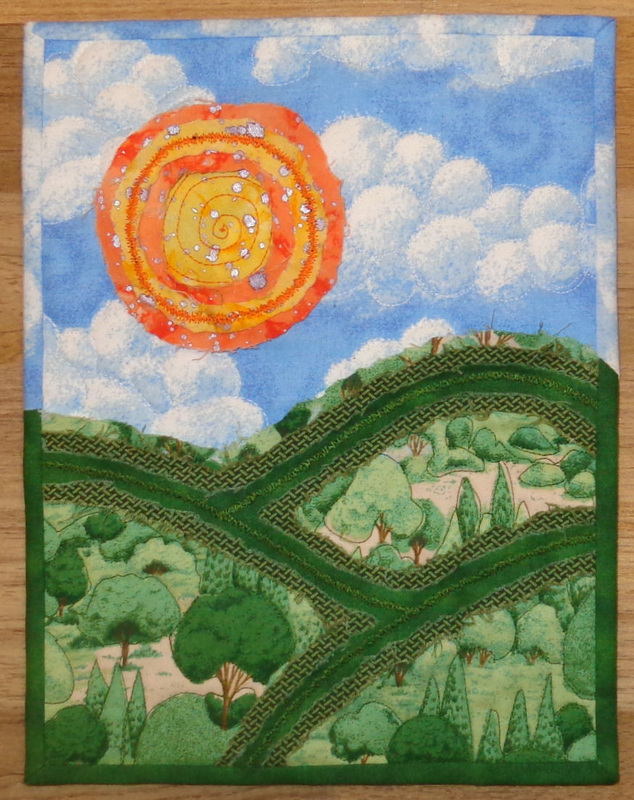 These two are made on the sewing machine, using some upholstery fabric and a bag of stuffing I found at Togs'n'Treasures. The bigger one is the size of a small soccer ball. 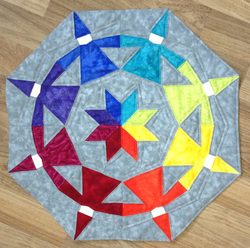 I found this paper piecing pattern on the internet. 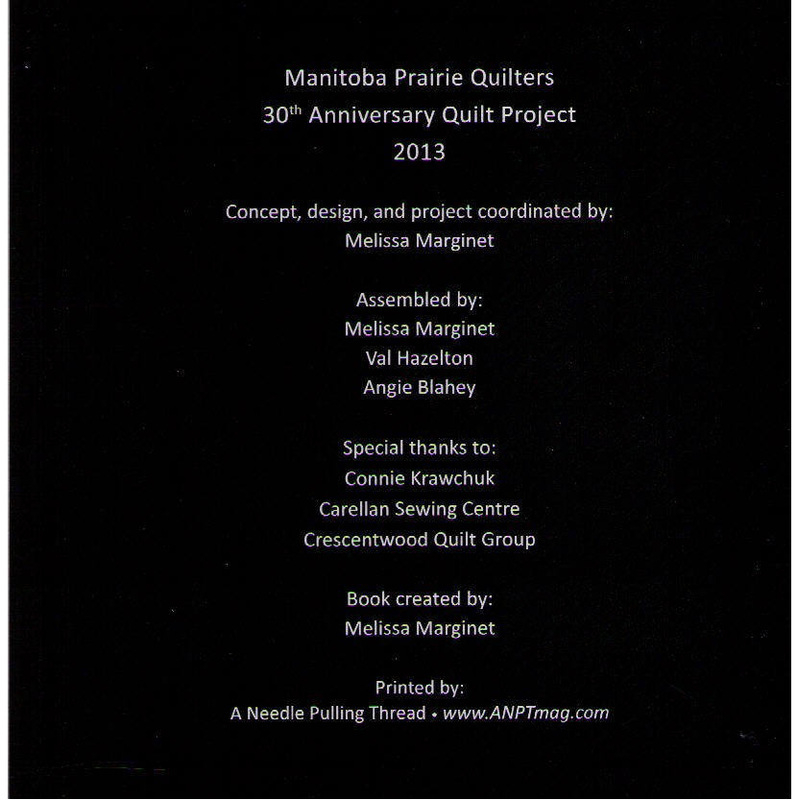 I will share the link with you when/if I find it again. 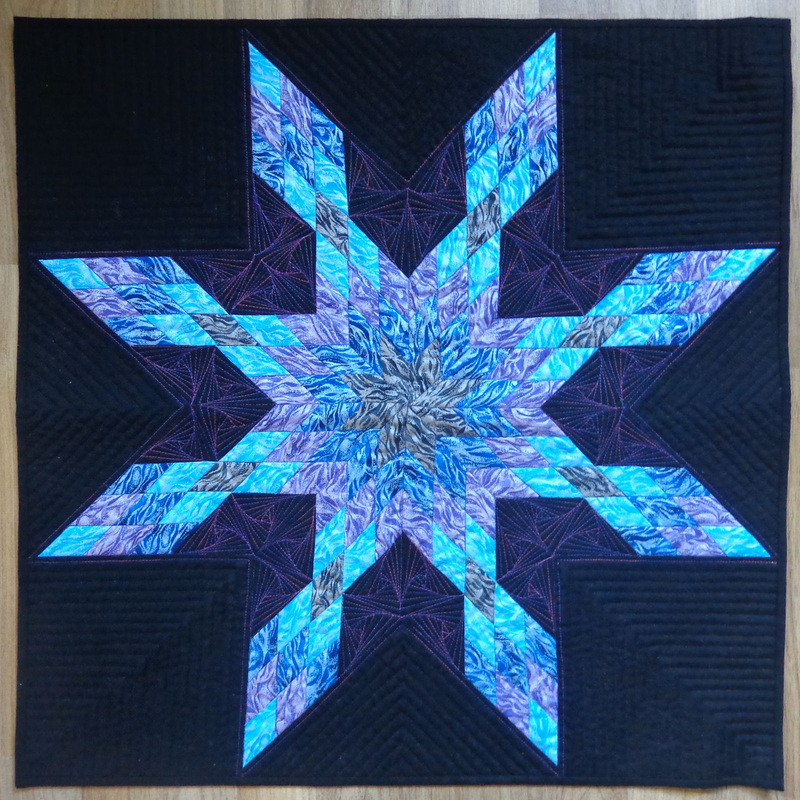 (Of course I changed it slightly). 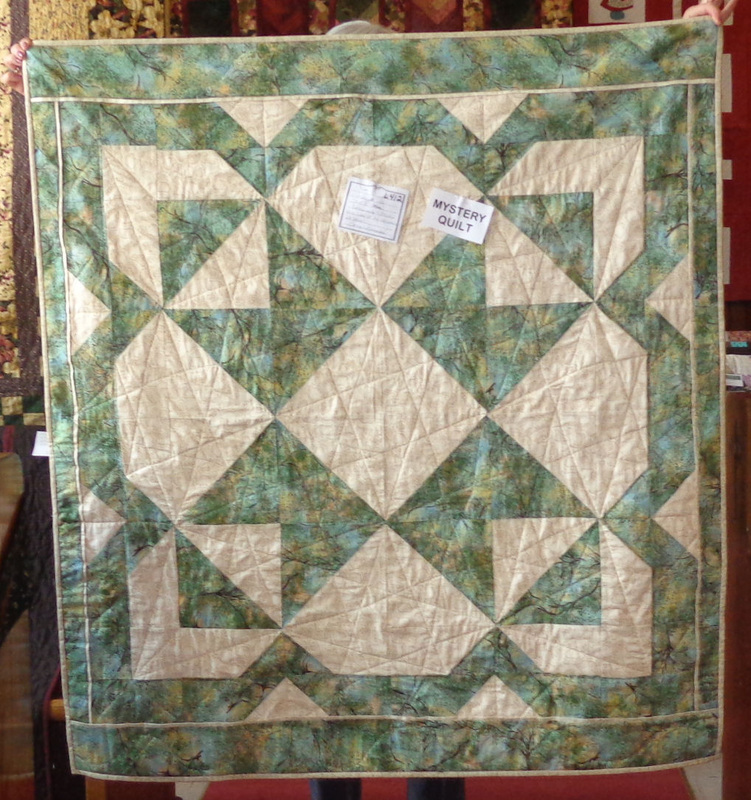 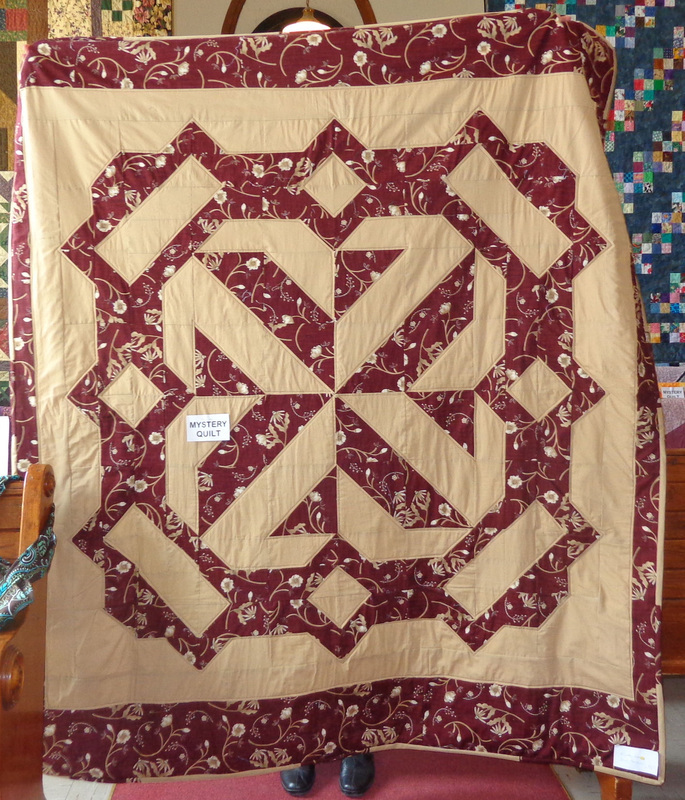 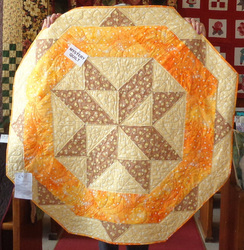 English Paper Piecing and machine quilted. 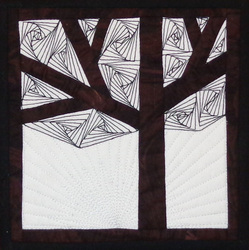 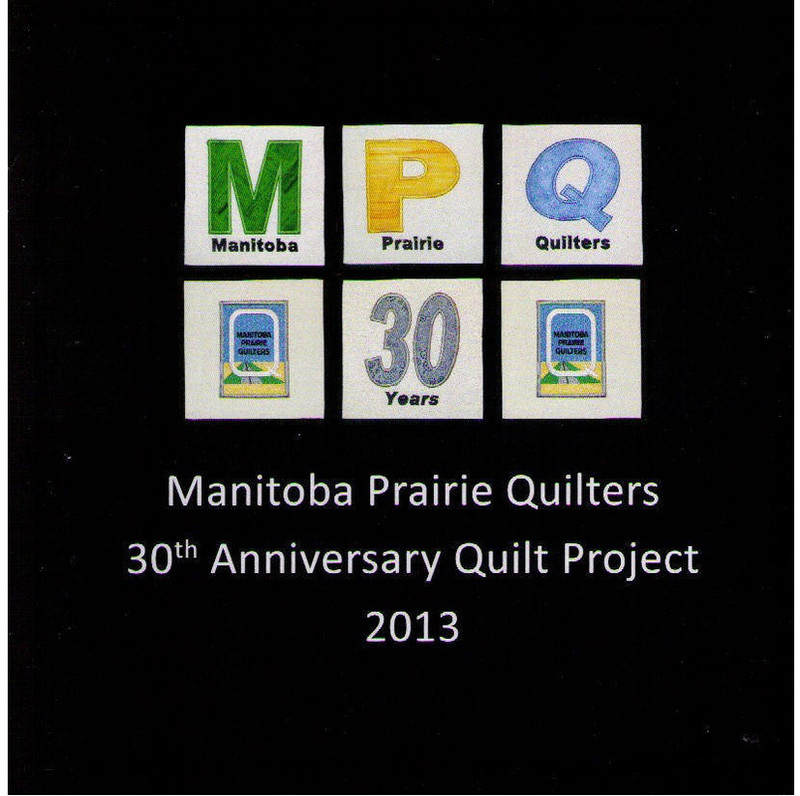 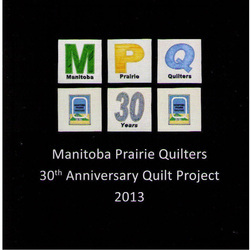 I liked my little tree I did for the MPQ 30th Anniversary Quilt so I made a slightly larger version of it. This one measures 12" x 12"
1st Place - Original design, any technique. 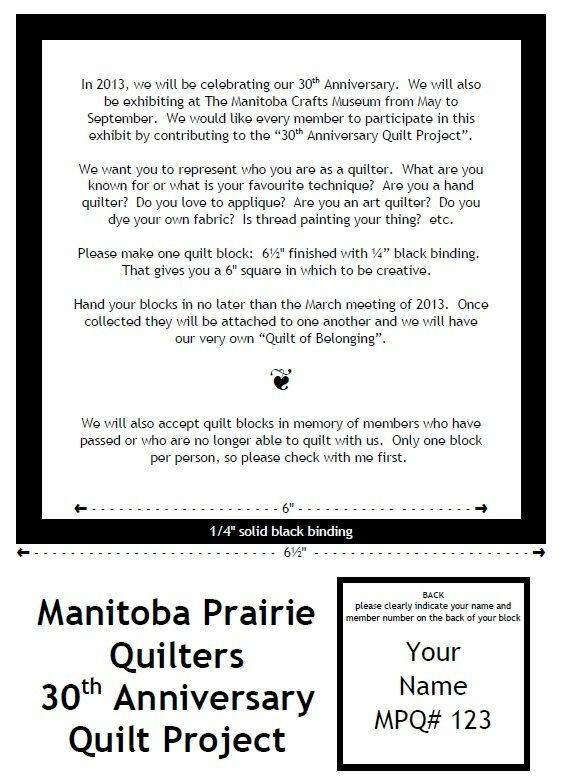 I have had this idea in my head for a very long time and finally decided to make it reality. 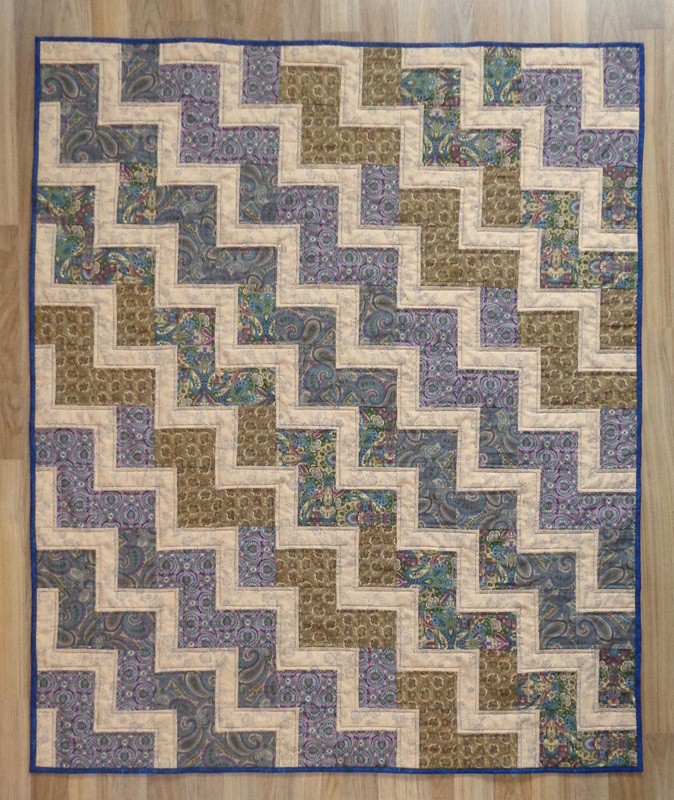 In the process of making the quilt, I have also written out the directions and it is for sale in my pattern store on Craftsy. 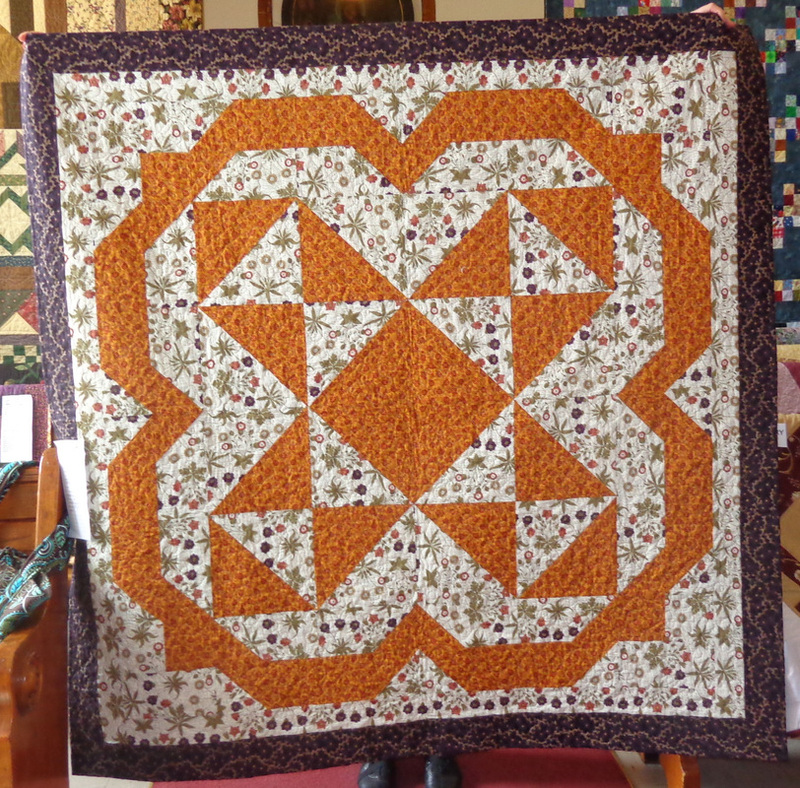 Made for Samantha and Sean's wedding shower. 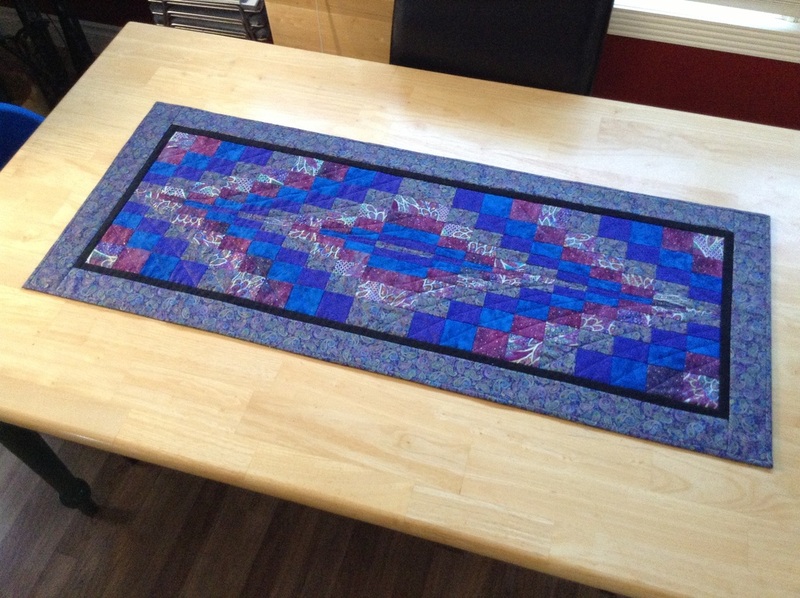 I made this table runner for a class I will be teaching. 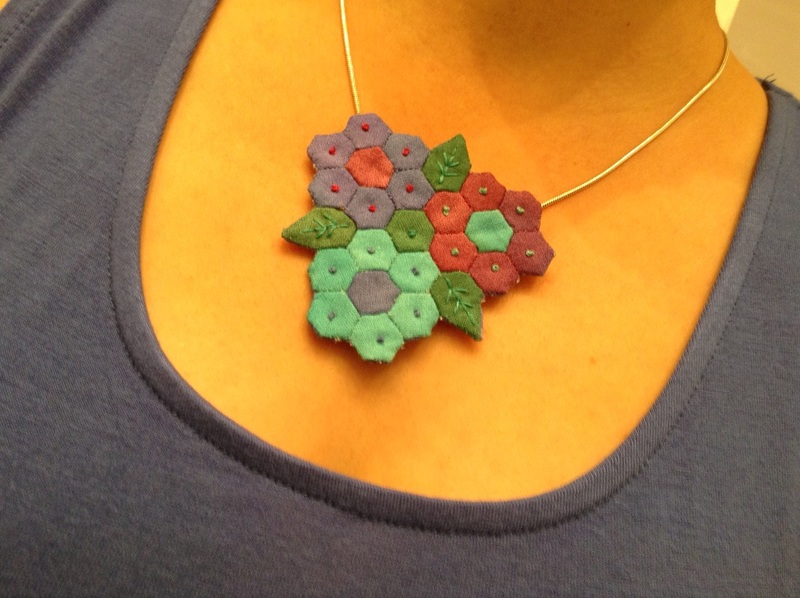 These little hexies are hard to make but it was so worth it. 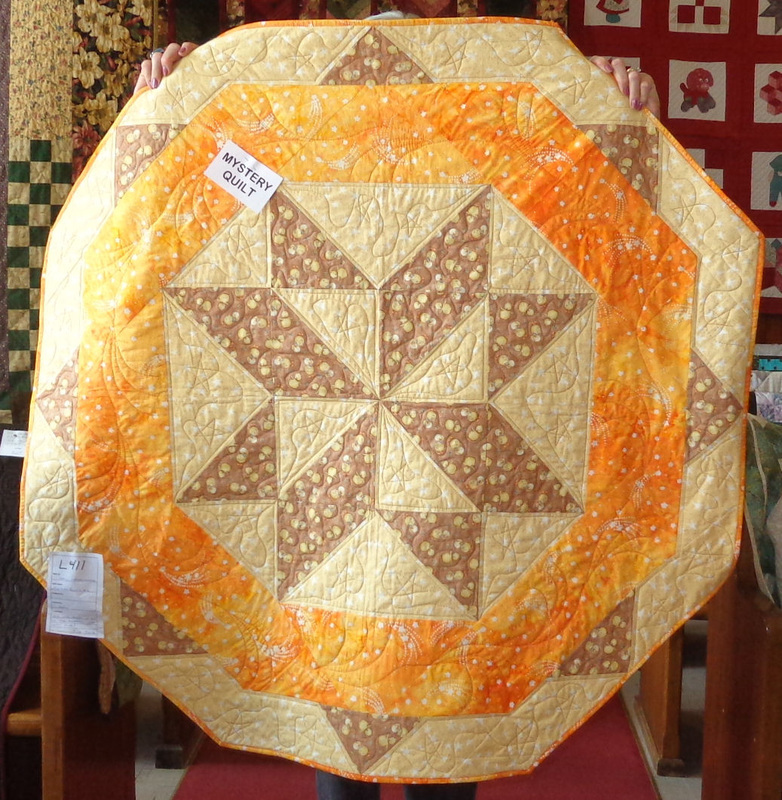 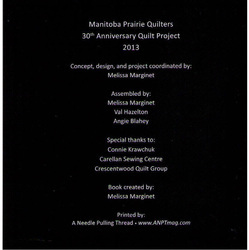 Common Threads Quilt Group has decided to make place mats for the Meals on Wheels recipients in our area. 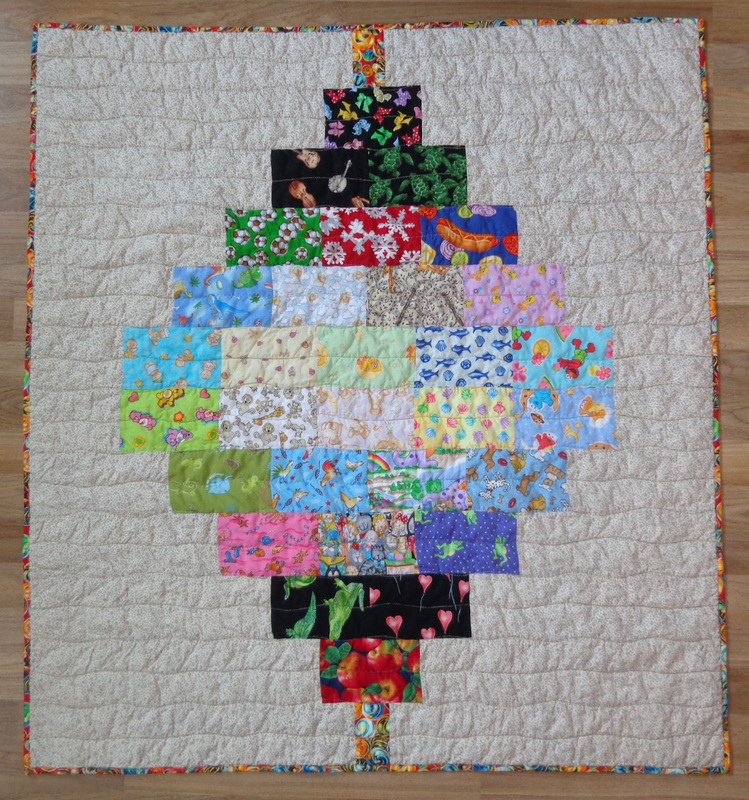 This is my contribution made from scraps from a tree shirt I made years ago. 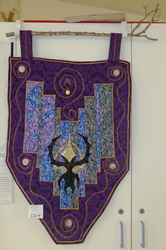 A friend recently lost her dad. 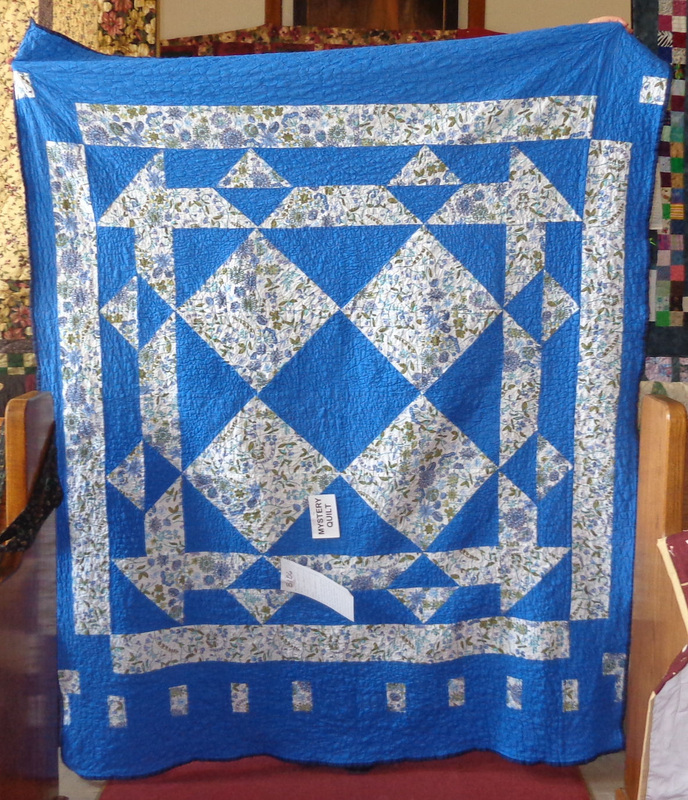 I made these quilts for her children out of her dad's shirts. 1) Measures 50" x 60". 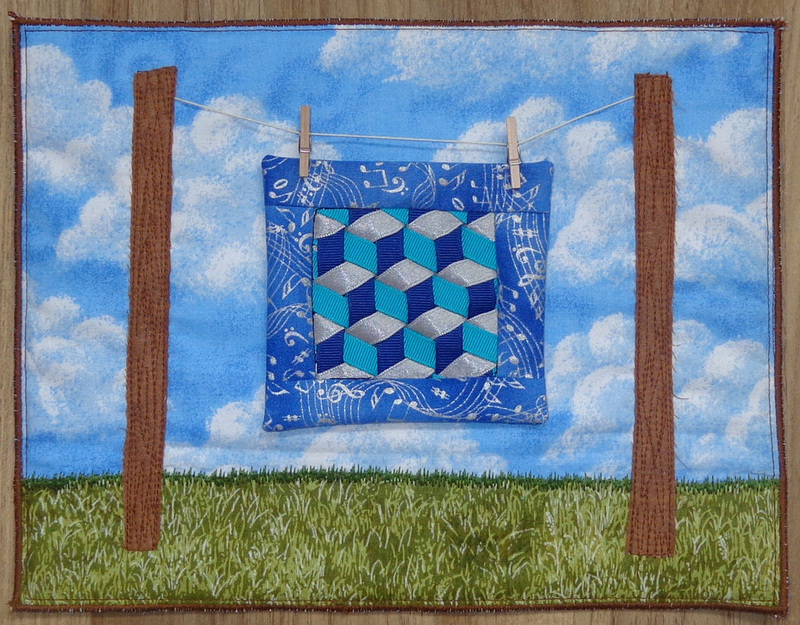 I backed the shirts with fleece so it only has two layers. 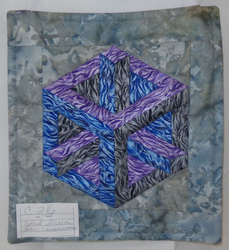 2) Measures 50" x 50". 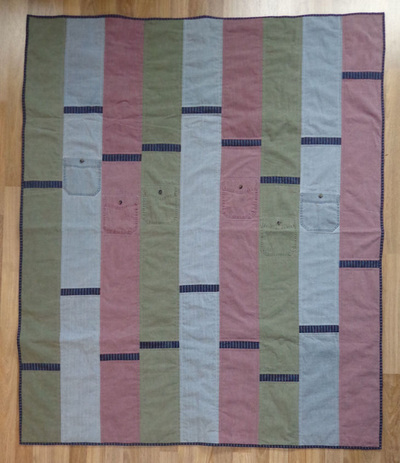 Also backed with fleece but it has a layer of cotton in between that I sewed the shirts onto so there wouldn't be as much stretch to the finished quilt. 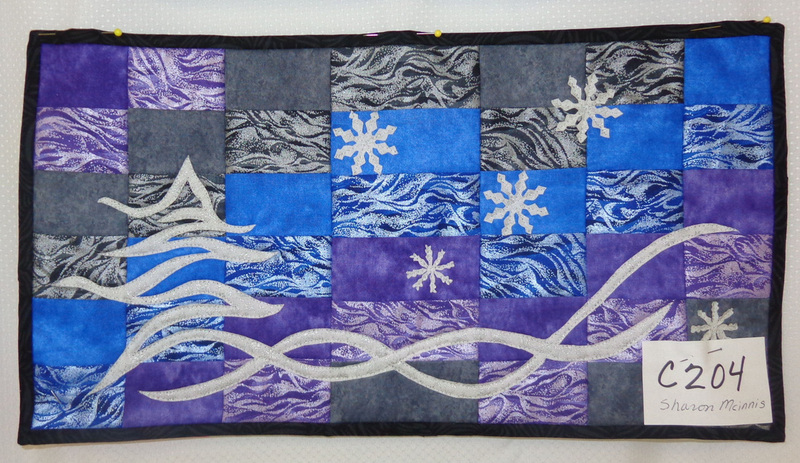 One block done one way then reversed, two fabrics. 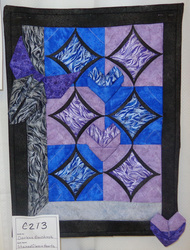 I just kept making blocks till I ran out of fabric then I rearranged them a few times till I got a pattern I liked. 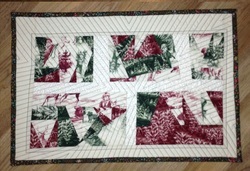 50" x 55"
Christmas present for Aya. 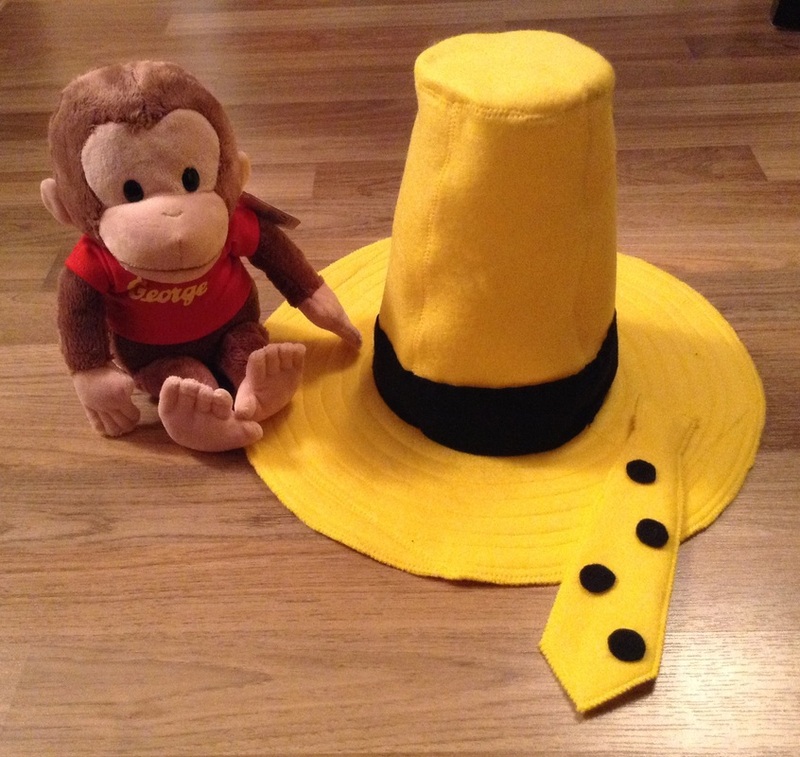 Bought the stuffed George and made the hat and tie. 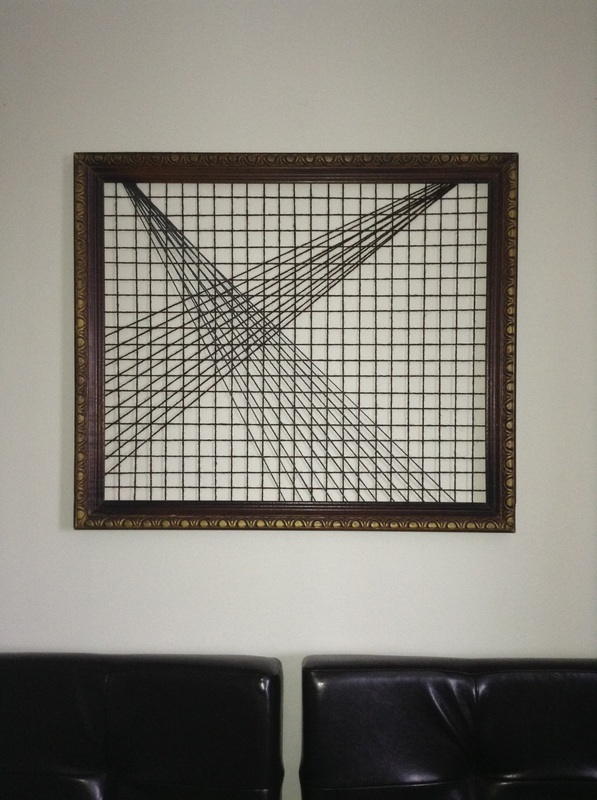 I wanted a piece of art for my wall before the family came over for Christmas so I made Art out of an old frame and some yard. I then tried another piece that was more planned but I don't like it near as much. 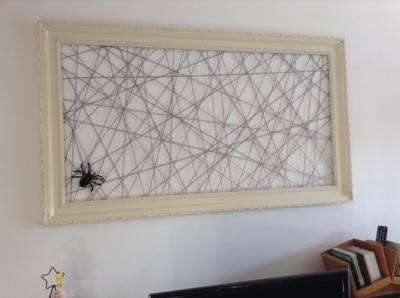 Oh, the spider was Rick's idea. Made for a friend to send to Japan for Christmas.